I love wearing black jeans, but have a problem with them! They always seem to fade after a few washes - is that how or what I wash them with, I'm not sure! I've not had these T K Maxx skinnies for long and they are already looking grey! So with the colour fade I've bought another pair from the Zara sale a few weeks ago. I wonder how long they will stay dark for? Hoping I've not gone over the top with the leopard print. In fact seeing the photos I realise the scarf and top look so similar they could be attached & the clutch adds more dynamics. The tee was under £10 and will be a really useful addition to my wardrobe. 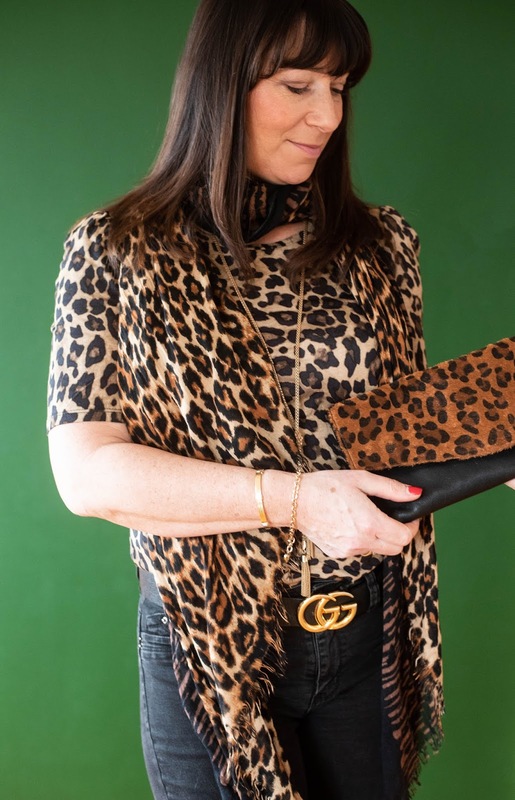 It'll be worn for both casual affairs and evenings out - I rather fancy getting some leather look trousers, paired with some strappy sandals it'll be a winning little number. The belt was just begging to be worn, and I'm smitten with it. I had a couple of extra holes made in it as losing weight made it rather baggy and didn't sit in place properly, looks good now though don't you think? How about a gold plunge necklace? This one's been around for a while and never fails to give just the right finishing touch. It's from Matalan they have a great selection of affordable jewellery, so do give them a look. 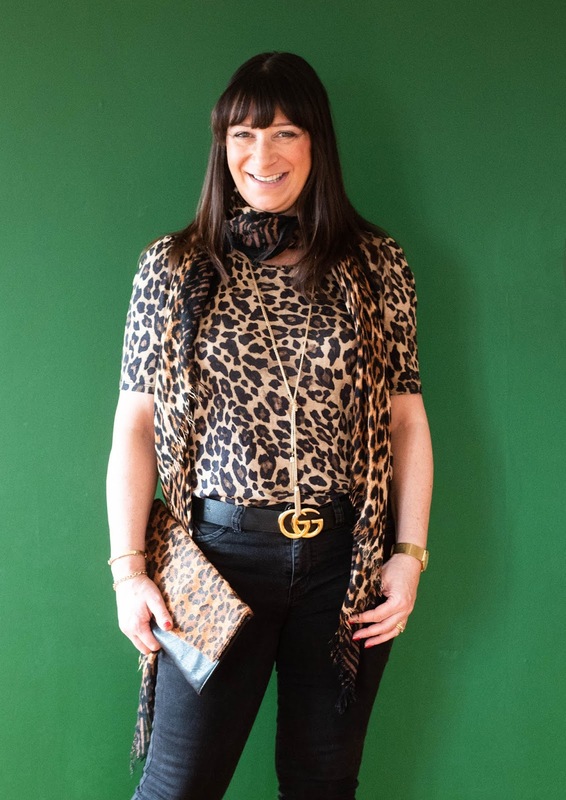 Go on - throw all you leopard patterns at one outfit like mine, I'm guilty as charged to admit this is my secret weapon, I always feel confident and somewhat brazen when donning creature comforts. Hubby bought the jacket for Christmas (I know he spoils me so much) I had left a big hint on the group message, that he obligingly took note of & bought the exact jacket I'd spotted. It's from a selection at Wallis. It's soft to touch, has a full zip and two side pockets. 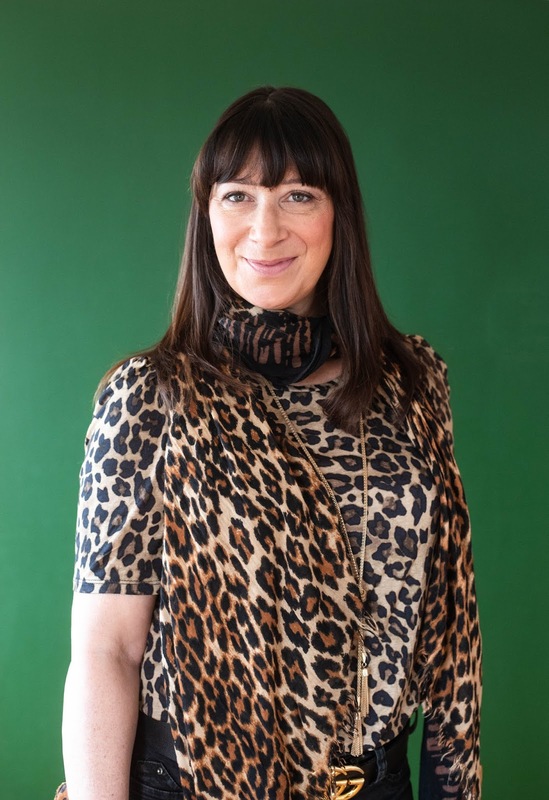 I was really pleased to get it as it's going to play an import role in my styles for months to come, pulling every outfit together like they were made for each other. Much appreciate your visit today, photos are c/o Esther Ruby. Catch you on Thursday when I'm sharing a blog about what I got up to in the last few weeks. Please do subscribe to my blog (see below) - I'm in the throes of starting a newsletter, so stay with me for that one my lovelies. Great look Jacqui, I'd wear this in a heatbeat. I've never met you but I feel this outfit reflects YOU and it's great with your hair colour. I bought my black skinnies from M&S last autumn and have washed them a trillion times as I wear them so much each week ... still black. I'd love to take ballet again. I'll have to find a country where they offer it. I try not to wash any of my jeans too much, but when I do, I wash them inside out. The dye is a good idea, too. Oh you should film a class! I never had lessons in ballroom dancing. I think it's amazing. 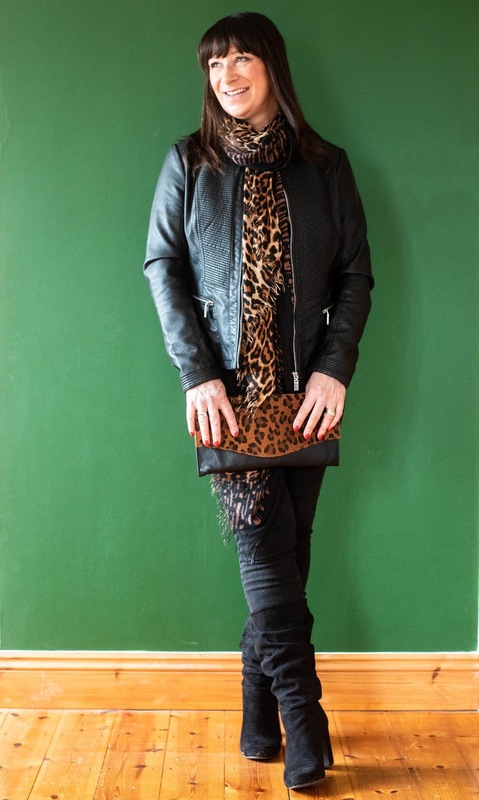 And that goes for your outfit too, I love leopard and leather so what's not to like! 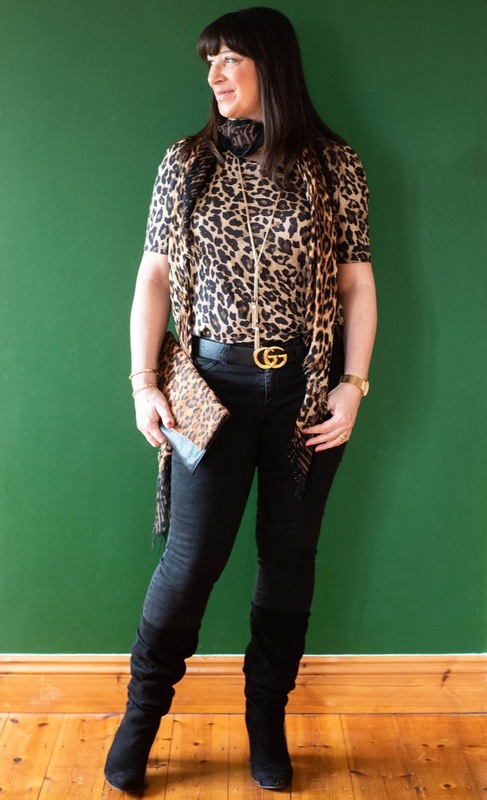 LOVE the outfit – you can't go wrong with a few animal prints!! 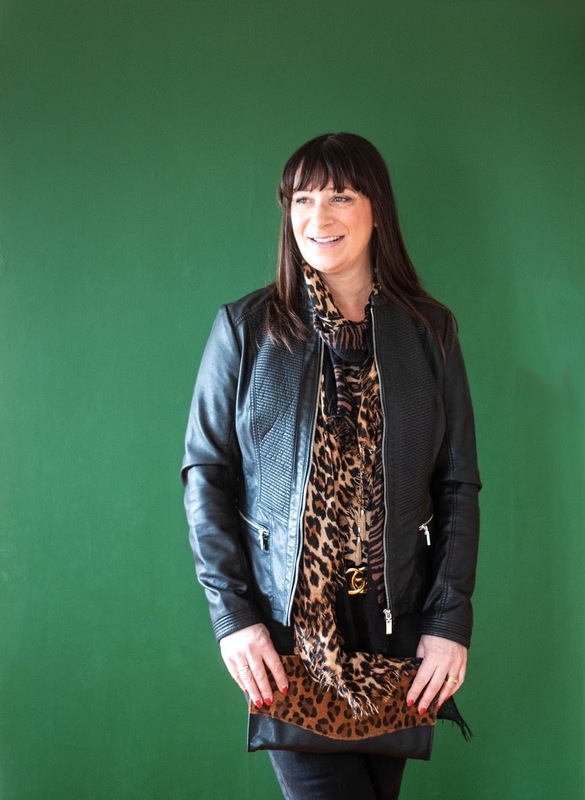 You are so right: black (faux) leather and leopard print! A perfect match according to you and I. But there are those who wouldn't even wear the black leather. They may need a tamer look. But I say age doesn't matter, and wear what you love. In my opinion, you look smashing! You're right the scarf and top do look like one piece! 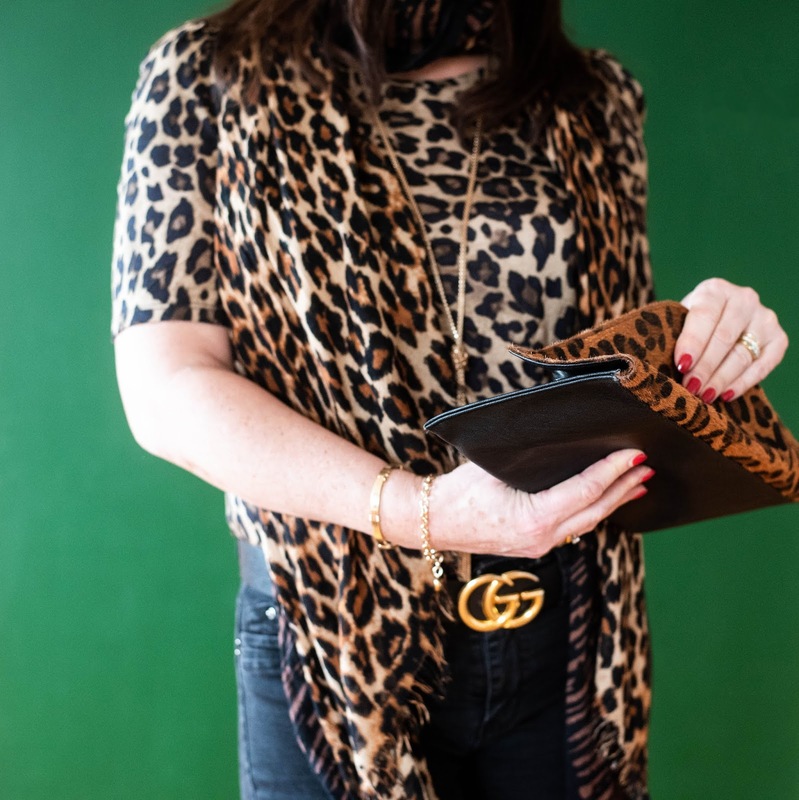 Such a fun way to layer up on the leopard print. Your dance lessons sound so fun! I've tried a few times, but I have no rhythm, at all, dancing is not for me, ha! Congrats on both the ballet and the ballroom - you're bang on with your fitness now aren't you? I wonder if losing weight has given you more confidence? You look in great shape and well done with all of those prints mixed up. It gets my vote of approval. Great look Jacqui. Love the leopard print :) I need to treat myself to a top like this. Thanks for sharing your post with us at The Wednesday Blog Hop. Well done on the dancing Jacqui, I'm very impressed! I'd love to learn latin dancing but what with my bunions and the husband's arthritic toe I don't think we'd be very good! I love all the leopard print together. It's annoying when dark jeans fade isn't it? I wash mine inside out, not sure if that stops the fading completely, it might just slow it down though. Thanks for linking up!